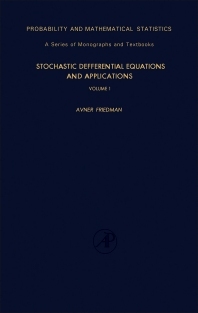 Stochastic Differential Equations and Applications, Volume 1 covers the development of the basic theory of stochastic differential equation systems. This volume is divided into nine chapters. Chapters 1 to 5 deal with the basic theory of stochastic differential equations, including discussions of the Markov processes, Brownian motion, and the stochastic integral. Chapter 6 examines the connections between solutions of partial differential equations and stochastic differential equations, while Chapter 7 describes the Girsanov’s formula that is useful in the stochastic control theory. Chapters 8 and 9 evaluate the behavior of sample paths of the solution of a stochastic differential system, as time increases to infinity.